The American Revolutionary War (1775�1783), also known as the American War of Independence, began as a war between the Kingdom of Great Britain and thirteen united former British colonies on the North American continent, and ended in a global war between several European great powers. The war was the culmination of the political American Revolution, whereby the colonists rejected the right of the Parliament of Great Britain to govern them without representation. In 1775, revolutionaries gained control of each of the thirteen colonial governments, set up the Second Continental Congress, and formed a Continental Army. Petitions to the king to intervene with the parliament on their behalf resulted in Congress being declared traitors and the states in rebellion the following year. The Americans responded by formally declaring their independence as a new nation, the United States of America, claiming sovereignty and rejecting any allegiance to the British monarchy. In 1777 the Continentals captured a British army, leading to France entering the war on the side of the Americans in early 1778, and evening the military strength with Britain. Spain and the Dutch Republic � French allies � also went to war with Britain over the next two years. Throughout the war, the British were able to use their naval superiority to capture and occupy coastal cities, but control of the countryside (where 90% of the population lived) largely eluded them due to their relatively small land army. 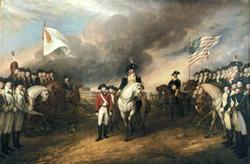 French involvement proved decisive, with a French naval victory in the Chesapeake leading to the surrender of a second British army at Yorktown in 1781. In 1783, the Treaty of Paris ended the war and recognized the sovereignty of the United States over the territory bounded by what is now Canada to the north, Florida to the south, and the Mississippi River to the west. 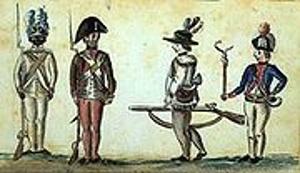 This reproduction of a 1780 drawing of American soldiers from the Yorktown campaign shows a black infantryman from the 1st Rhode Island Regiment. 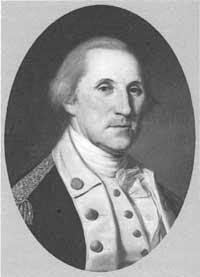 George Washington at the Battle of Princeton Washington, however, was not finished. 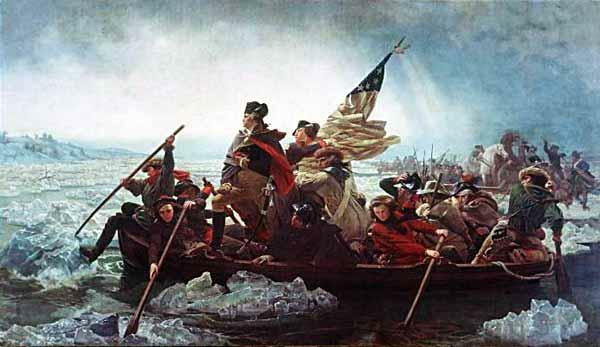 On Christmas Day, 1776, he crossed the ice-filled Delaware River and surprised the Hessian winter encampment at Trenton, New Jersey. Over 900 of the 1,400 Germans were captured, and 22 killed; only 4 Americans were dead. Washington followed up this brilliant stroke with a lightning attack on Princeton, New Jersey, on January 2. 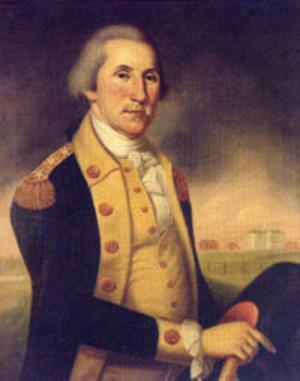 The overcautious General Howe decided to retreat to New York, abandoning New Jersey and thousands of Loyalist supporters. 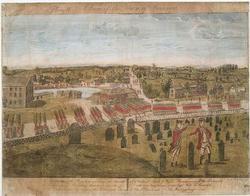 Only a small part of the great British army had been defeated, and yet New Jersey was lost. Washington broke all the rules. Well- behaved armies spent six "winter" months (December through May or June) in camp, not in the field. It was rude indeed to interrupt Hessians sleeping off their Christmas parties. And it was audacious to challenge a much larger, much better equipped enemy with a ragged, hungry little force. But battles are won by audacity, and Washington's bold moves revived patriot spirits and demonstrated to the British that conciliatory tactics would never bring the Americans to heel. 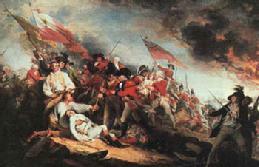 To browse our entire color photo gallery on the Revolutionary War!